My Bathroom Mirror: I spy with my 8 eyes! I spy with my 8 eyes! Insects and I share a love-hate relationship that leans particularly toward the hate. Not all insects though. I love brilliant butterflies and wee lady bugs; most insects don't bother me but of course there are specific exeptions. Like say a stinky cockroach or a horrendous spider or those nasty insects that stick like glue to night lights! Shudder fest indeed! I don't even know where and when I developed a fear of spiders and cockroaches. It's like I see either one and my body goes into auto shut down. The insect stares at me and I stare back at the insect. My brain goes on hyperventilation mode, begging my feet to move, shake, lift, tap dance... anything! But nah! My body remains steadfastly rooted to the spot. The only things that move are my eyes. Watching the insects every darn move. Once a typical cowboy styled showdown happened between me and a cockroach. There he was right between me and the front door/escape route. I stared at the cockroach, the cockroach stared back at me. A background score of "The good, the bad and the ugly" played and we just stared and stared. I blinked! Seizing that moment of weakness the blasted creature flew into my open hair! I had pretty big hair back then and it had the amazing ability to behave like a black hole at times. I screamed bloody murder, scratched and clawed at my head, jumping around like my pants were on fire...but to no avail! The black hole had triumphed again! But no! Lo and behold! Out staggered the cockroach completely disoriented, so disoriented it couldn't even fly. I kid you not when I tell you, even a few minutes in my hair and even a boy scout with a compass would get lost! And don't even get me started on the time I was stalked by a cockroach. I did start anyway...so one night I was home alone studying for my boards. There I sat trying to jam physics theories into my head when I heard a flutter en I heard a flutter of gauzy wings. A glance around revealed nothing out of the ordinary. Back to physics. The flutter came again. A little nearer this time. I look down and almost died. At my feet sat the fatest, most ugliest, most disgusting looking cockroach I have ever clapped my horrified eyes on! I don't have an ounce of sports in my veins but the way I ran that day, P.T.Usha would have gladly handed over all her medals to me! So I ran upstairs and peeped down. To my horror the fiend from hell was lazily making its way up toward me!! I bolted for my bedroom and jumped under the covers, not even daring to switch on the lights lest it saw me! 10 mins of silence later I slowly slide off the covers and switch on the lights. By the name of everything unholy!! I can't even tell you what happened next! I can't! I can't! Ok fine i shall! The cretin sat on the covers! The covers that were on my head moments ago!! I screamed all the way down only to see it flying down along with me!! If that is not stalking then you and I have different dictionaries! Thankfully my parents came home right then and my mum went total terminator on that stalker! Phew! I did sleep with one eye open that night! 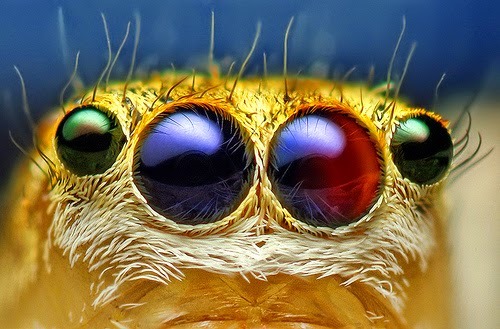 Spiders are no cuter! I can handle the teensy ones. But those hideous, huge black ones that hide in bookshelfs and kitchen cabinets? Yeah now those are monsters! Even worse is when they scuttle around carrying their bulbous egg sac! Might as well book me into a psych ward right then and there! My mum has a Phd in pulverizing these 8 legged freaks, while I have a Phd in screaming my throat raw when I see them. Hey I am the greatest spider alarm system in the world ok! So this one time I used the guest bathroom, reading on the throne. I happened to look up laughing at a joke in the book and there it sat on the wall right in front of me. My laugh turned into curdled whimpering and I sat frozen on the closet! I just sat there doing nothing. Again a long staring session happens. Finally I manage to wash up and run out the bathroom screaming! "Where is it? Where is it?" My mum comes in screaming armed with a broom. "Agagabbanabaa" is all I could muster. My mum is about to make his way into the bathroom when my dad brushes her aside and says he will handle it! "Oh no!" I think. Entire squadrons of spiders owe their lives to my dads bumbling interference. My dad rushes into the bathroom and promptly chases it behind the mirror! Thanks dad! "Everything is fine!" He cheerfully says " it went behind the mirror and it will go off on its own!" And off he went humming a happy tune! My mum sighs and goes in and out within 5 mins, dead shrivelled spider in the dustpan. The bloody thing was carrying an egg and that had broken as well. I don't even want to describe what I saw! It scarred me for life!! My mums promised me lessons in arming myself against these creatures. All that's come out of it is that my screaming got better and from the pitch and tempo, my mum can actually tell if it is a spider or a cockroach that is scaring me to death! Ha ha glad you enjoyed it!! nice blog . mirrors clears the reality of the world.